The Pentagon dispatched two guided missiles destroyers through the Taiwan Strait this week in a show of force amid increasing Chinese efforts to coerce democratic Taiwan. 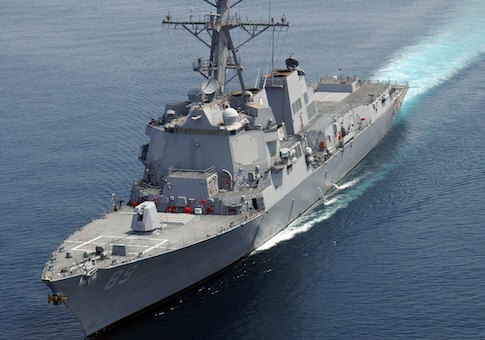 On Sunday, the destroyers USS Mustin and USS Benfold sailed through the 100-mile strait in international waters, Pentagon spokesman Lt. Col. Chris Logan said. "U.S. Navy ships will sometimes transit between the South China Sea and the East China Sea via the Taiwan Strait and have done so for many years," Logan said. The last Taiwan Strait transit took place in July 2017 when a single destroyer made the trip. The latest operation fell short of Pentagon plans to send a U.S. aircraft carrier strike group through the waterway that has become an increasing point of contention between China and the United States. The warship operation in the strait also coincided with the Rim of the Pacific, or Rimpac, military exercises—the world's largest international naval maneuvers that are currently underway in the Pacific. The U.S.-led exercises will continue through Aug. 2 and involve military forces from 25 nations. The exercises will see activities by 45 surface ships and submarines, 17 national land forces, more than 200 aircraft, and 25,000 military personnel. Forces from Israel, Vietnam and Sri Lanka are taking part in Rimpac for the first time. The Navy's Pacific Fleet, that organizes the biennial exercises, said in a statement the exercises are "critical to ensuring the safety of sea lanes and security on the world's interconnected oceans." "Rimpac is not only the world's largest international maritime exercise, it also shows that like-minded nations who value a free and open Indo-Pacific want this opportunity to improve our cooperation with each other," said Adm. John C. Aquilino, commander of Navy's Pacific Fleet. China's military was disinvited to the exercises this year after taking part three times, based on U.S. opposition to Beijing's militarization of disputed islands in the South China Sea. Chinese warships conducted an island encirclement drill around Taiwan last month, according to Chinese state-run media. In May, Chinese air force H-6 bombers, surveillance aircraft, and Su-35 fighter jets circled the island in exercises. Beijing claims the island is a breakaway province. Beijing also recently increased tensions by unilaterally opening a commercial airline route down the middle of the strait without consulting Taipei. The commercial flights were launched recently and often require Taiwanese air forces to send interceptor jets to monitor the flight over concerns the jets could be military flights. China also has threatened U.S. airlines with unspecified punitive measures unless the airlines change their websites and apps to identify Taiwan as a Chinese province according to Beijing's dictates. Taiwan is known as the Republic of China and split from the mainland during the civil war between communists and nationalists in the late 1940s. The two Navy warships sailed along a line close to the center of the strait during the operation that was described by a defense official as "innocent passage" a subset of more intrusive freedom of navigation operations that are often intended to challenge a state's territorial claims. The operation is part of a coordinated Pentagon policy of regularly asserting international waters claimed by China as its maritime territory are in fact open and free. China through diplomatic bullying and threatening statements has tried to prevent such warship passages in the past, in a bid to establish hegemony over the Taiwan Strait, areas of the East China Sea, and nearby South China Sea. The Pentagon is considering sending an aircraft carrier through the Taiwan Strait in the future, and also may dispatch warships to visit Taiwan to further highlight the importance Washington places on maintaining ties with a free and democratic state in Taiwan. Col. Robert Manning, the chief Pentagon spokesman, said of the two destroyers' passage: "It's international waters. We can fly, sail, operate anywhere we want that's legal." As expected, the ship transit drew the attention of China's government that criticized the naval operation. "We have expressed our concerns to the U.S. side on this," said Foreign Ministry spokeswoman Hua Chunying. "It must be pointed out that the Taiwan question bears on China's sovereignty and territorial integrity and it is the most important and sensitive issue in China-U.S. relations." Hua urged the United States to "prudently and properly handle the Taiwan-related issues, lest it should undermine China-U.S. ties and the peace and stability across the Taiwan Strait." A hardline, state-run newspaper affiliated with the ruling Chinese Communist Party denounced the naval operation as part of psychological warfare by the United States. The Global Times stated in an editorial Monday that the United States was sending "political signals" with the warship passage. "In the future, Washington may send larger warships to the Taiwan Straits, conduct military training and drills, and even collaborate with Taiwan's military in an attempt to deter the mainland," the newspaper said. "But Washington will not succeed. The mainland's military strength has improved greatly since the 1996 crisis and is capable of countermeasures to deter Washington and the Taiwan administration from provocations." In 1996, the Pentagon dispatched two aircraft carrier strike groups to waters near Taiwan after Beijing fired missiles north and south of the island in a bid to intimidate Taiwan voters before a presidential election. China backed down at the time but stepped up a major military, and in particular naval, buildup. Senior Chinese officials complained about American support for Taiwan during the visit to China last month by Defense Secretary Jim Mattis. The officials objected to passage of recent legislation called the Taiwan Travel Act that calls on the Trump administration to increase military and government exchanges with Taiwan. Mattis told Chinese leaders that U.S. policy toward Taiwan is unchanged and in line with the United States' policy toward the island. The 1979 Taiwan Relations Act requires the United States to supply defense arms to Taiwan and to defend the island in the event of a Chinese military attack. The current defense authorization bill, now in a House-Senate conference, calls on the Trump administration to bolster Taiwan's defenses through expanded joint training, foreign military sales of asymmetric and undersea warfare capabilities, use of security cooperation authorities, and visits to Taiwan by military service secretaries or members of the Joint Chiefs of Staff. The warship passage also comes amid heightened U.S. trade tensions. Both countries traded billions in tariffs as part of President Trump's tough approach to Beijing's unfair trade practices and technology theft. China's senior official for Taiwan affairs, Liu Jieyi, said the latest Navy passage through the strait is part of the United States playing the "Taiwan card" against China, Taiwan's Central News Agency reported. "We staunchly oppose any move that harms China's national interest. We won't accept that," Liu said on the sidelines of a forum on cross-strait ties in Hangzhou. "The Taiwanese public should clearly understand the real purpose behind these U.S. moves and not help them to play the ‘Taiwan card,'" he said. This entry was posted in National Security and tagged China, Military, Pentagon, Taiwan. Bookmark the permalink.